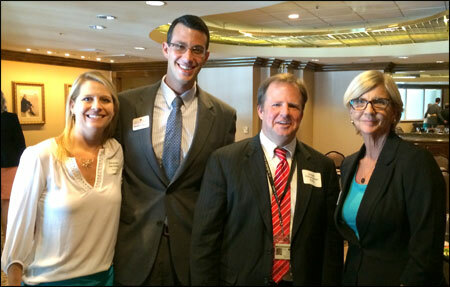 Rice & Rose Attorneys Beth King and Matt Shapiro are pictured here at the Daytona 500 Club with Judge Chris Kelly and Attorney Amanda Jacobsen at the July 31 annual meeting of the Volusia County Bar Association. Ms. King was sworn in as a new member of the Board Of Directors of the VCBA. Mr. Shapiro was installed as a Board Member on the Young Lawyers Division.